Chinook salmon are the largest of the Pacific salmon, with some individuals growing to more than 100 pounds. These huge fish are rare, as most mature chinook are under 50 pounds. Most chinook spawn in large rivers such as the Fraser and Skeena, although they will also use smaller streams with sufficient water flow. They tend to spawn in the mainstem of streams, where the water flow is high. Because of their size they are able to spawn in larger gravel than most other salmon. Chinook spawn on both sides of the Cascade Range, and some fish travel hundreds of miles upstream before they reach their spawning grounds. Because of the distance, these fish enter streams early and comprise the spring and summer runs. Fall runs spawn closer to the ocean and more often use small coastal streams. All chinook reach their spawning grounds by fall, in time to spawn. Chinook fry rear in freshwater from three months to a year, depending on the race of chinook and the location. Spring chinook tend to stay in streams for a year; fish in northern areas, where the streams are less productive and growth is slower, also tend to stay longer. Rearing chinook fry use mainstems and their tributaries. Most anglers target Chinook Salmon in the spawning rivers and in the oceans and tributaries near the Chinooks spawning rivers as they return to spawn. The Chinook primarily feed on small fish such as Herring and also squid. Fishing for Chinook Salmon in the ocean is usually done by trolling lures or bait. Early in the morning and at dusk Chinook can be in water just 10 to 50 feet deep. A 9 foot medium to heavy action rod with a level wind, conventional, or knuckle buster reel spooled with at least 250 yds of 25 to 30 pound line is sufficient. At the end of your mainline 4 to 8 ounces of weight that is 4 to 6 feet above a barrel swivel that is attached to an 8 inch flasher with 20 to 30 inches of leader. At the end of this leader a cut or whole herring, squid, hoochie, salmon plug, or salmon spoons are attached and trolled slowly at about 100 feet behind the boat. The drag on your reel should be set to a minimum. During the day Chinook Salmon can move to water depths of 60 to 200 feet. To reach these depths while trolling you will need to use a downrigger. The same set up can be used but with a 10 lb cannon ball instead of the small weights. Chinook are a wary fish so the flasher should be clipped into the release at 20 to 30 feet behind the release clip. Spincasting or baitcasting rods and reels are used to cast a variety of lures at Chinook once they enter the mouths of their spawning rivers. In the rivers a lighter line of 12 to 15 pounds is used as Chinook Salmon become more wary of tackle. The Chinook Salmons urge to feed slows as it enters the rivers and becomes less as it moves up the river until it becomes non existent. The closer to the river mouths that you fish the more likely you are to hook a Chinook. Lures, spoons, and spinners that are productive for casting to Chinook are Gibbs Wonder Spoons, Gibbs Croc, Gibbs Koho, Gibbs Sil-Vex, Bluefox Nickel Plate Pixee Spoons, Buzz Bombs, Blue Fox Super Vibrax Spinners, and the Mepps Aglia Spinners. Colors of lures that are most popular are chrome, brass, red, orange, pearl, green, army truck, blue, and chartreuse. Sharpen those Hooks – Salmon have a thick jaw that can make setting a hook more difficult. You’ll want to make sure that your hooks are razor sharp when fishing for salmon. We recommend using the Gamakatsu Barbless Octopus Brand. You must use single barbless hooks when fishing for salmon in British Columbia, its the law. Overcast for Success – Salmon prefer low lighting conditions, thus making days with an overcast more successful for salmon fishing than other days. In addition to overcast days, dawn and dusk provide optimal light conditions for salmon. You can still catch salmon on bright sunny days but they will be in deeper water and slightly less active. 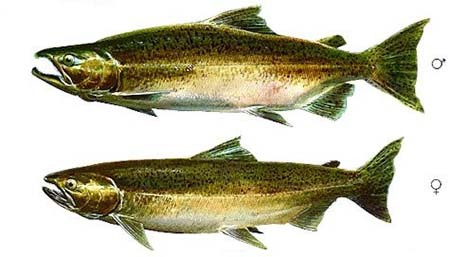 The Best Bait for Salmon – It’s a known fact that one of the best methods for catching Chinook salmon with live bait is to use roe (eggs) in rivers or herring/anchovie in the ocean. You can purchase these types of bait or actually harvest and cure your own. For artificial lures, we recommend using spinners such as the Blue Fox. Learn to Drift Fish – One of the most up and coming methods for fishing for salmon is drift fishing. This is useful for river fishing for salmon, you basically cast your bait upstream and let it drift down over a pool or area where you think salmon are. This produces a more natural bait presentation to salmon. Get the Stamp – To catch and keep salmon in BC you’ll likely need a special stamp or permit along with your fishing license. It’s important to have this to prevent you from getting a large fine. It’s also important because the cost of the stamp/permit is used to fund salmon stocking and conservation programs. Hopefully my goal to make you a better salmon fisherman was achieved with the information you gained reading this section. However, you may still want or need to research other sources to improve your salmon fishing skills. That’s why I put together the below resources, they provide additional information on fishing for salmon and may also help improve your angling skills. Float-Fishing for Salmon & Steelhead – If you’re interested in float fishing then this is the perfect book for you. How to Catch Salmon, Sturgeon, Lingcod, Rockfish, and Halibut: Along the Pacific Coast - Packed with no-nonsense information on behaviors and best methods & equipment for catching more salmon, rockfish, lingcod, sturgeon, and halibut. Salmon – Wikipedia – Get more scientific information on salmon at Wikipedia.org. IGFA All-Tackle Fishing Records – Visit the International Game and Fish Association website to get more salmon fishing records and/or fishing records for other types of fishing.